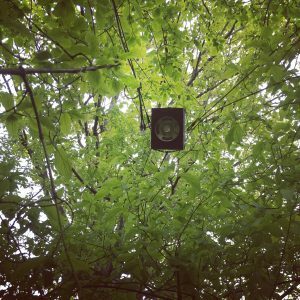 VOICED is an immersive sound installation embedded amongst the trees, undergrowth and ruins of the Bethnal Green Nature Reserve. Sarah Westcott will be the featured artist throughout the month of May. Westcott has a science degree and an MA in poetry from Royal Holloway, University of London. She grew up in north Devon on the edge of Exmoor, and is inspired by the natural world and the places where human and non-human intersect. Westcott’s pamphlet Inklings was a winner of the Venture Poetry Award and the Poetry Book Society’s Pamphlet Choice for Winter 2013. Voiced is a collaborative project commissioned by artists Lucía Montero and Duncan Robertson.